I have needed a new wallet for so long, and I knew I had to make a sewing pattern that would check all the boxes the first time around. My wallet pattern had to have closed ends so that nothing would fall out, it had to have card slot pockets, a zipper pocket for coins, and most importantly - I had to be able to fit my cell phone in this wallet. Sometimes I just want to grab my wallet and run, and sometimes I just want to throw it in a backpack when I'm going out for a walk and I need to have a place to put my phone. It all came together one day when I was surfing the web and found a small pouch, that had end flaps that folded up to create sides. 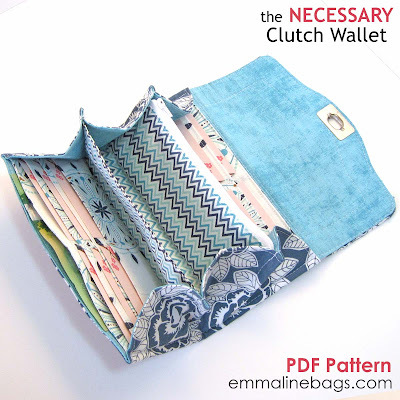 This pouch was only about 3 inches wide or so, and didn't have any of the pockets I wanted, so I got out my pen and paper and worked out all the dimensions to create a pattern that would hold my cash and two lots of card slots with 6 areas for cards in each. The end result, The Necessary Clutch Wallet ePattern, is exactly what I've been wanting! 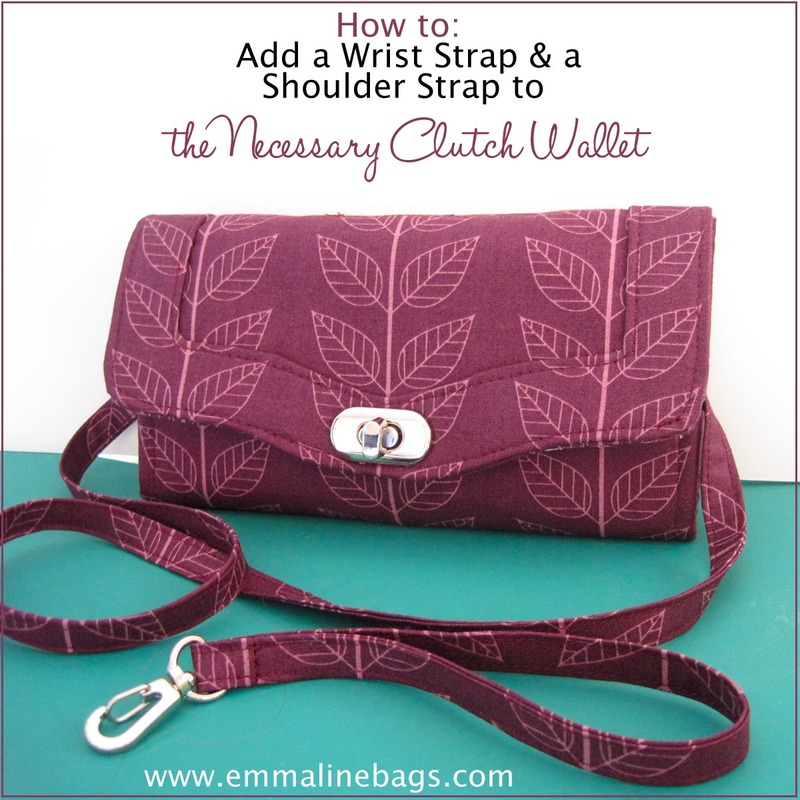 It features a twist lock closure on the flap, that can be substituted with a heavy snap. There is a border detail on the flap to create stiffness and, I think, some professional looking detail. And the best part... there not just one, but several places to put my phone! 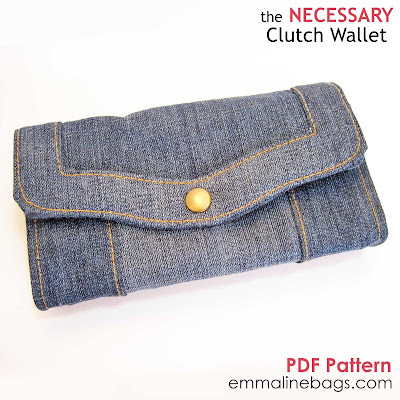 I can put it either of the cash pockets, in the two divided areas by the slot pockets or in the wide center pocket. The center pocket is 1" wide at bottom, so it could hold your phone, or even hold lipstick, a treat for later, or your fave sunglasses! Try a snap instead of a Twist lock! I love this wallet, and I don't know if I'll ever have to buy one again. I can see myself making this one hundred times over. 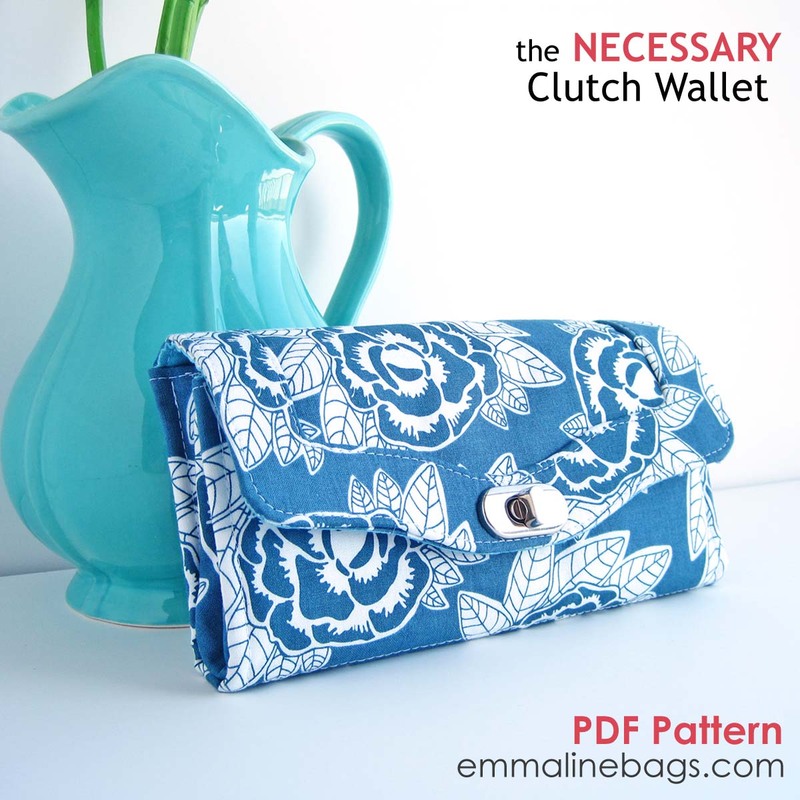 These wallets will make fantastic gifts! You can find The Necessary Clutch Wallet HERE in my shop. The twist locks are on the way and will be available to purchase in my shop early next week. Also, watch for a tutorial coming to add a wrist strap and and thin removable shoulder strap. After a few requests, I've decided I need to make this available and I'll have it here on the blog in my tutorial section in a few days. UPDATE: The Wrist and Shoulder Strap Tutorial is available HERE!! I was waiting for it. It's fabulous!! Just what every girl should have. I bought it on Saturday night and worked on it yesterday. When I finished I couldn't believe what I've just sewn. I see myself making many of these. The additions you mention will be great. I still have to take pictures and share. Thanks for such a wise pattern. Hi Janelle, could this be done with a zip instead of a catch? Hi there! Yes your question makes sense! You can print off another D pattern piece so you have another large oval, fold it in half lengthwise and mark this line across the entire paper piece. Add a 1/4" seam allowance to one side of this line with a gridded ruler and then cut the two halves apart on this second line. Throw the smaller half away. You now have 1 paper pattern piece with a 1/4" seam line. You can use this to cut a front and a back of the exterior wallet, turning your print opposite directions for each, so that the front is one way, and the back is another. I hope that makes sense ! Each person has their own style and this is why discount designer purses are all so different. They can have different colors, sizes and shapes and they can be made out of different materials. Some of the most popular wallets are the leather ones.